This is Scriptum Oblivionis, my blog for Warhammer, my own universe I'm building through video games and novels, and anything else creative I do. The latest in a long string of supplemental army books has been released, and I've decided to actually start talking about them, even the ones that aren't necessarily relevant to me, because everyone should hear my opinion on everything, clearly. So, I'm gonna take a look today at the Crimson Slaughter supplement, having had a chance to read through it, and give my thoughts, in a similar format to my Clan Raukaan review. 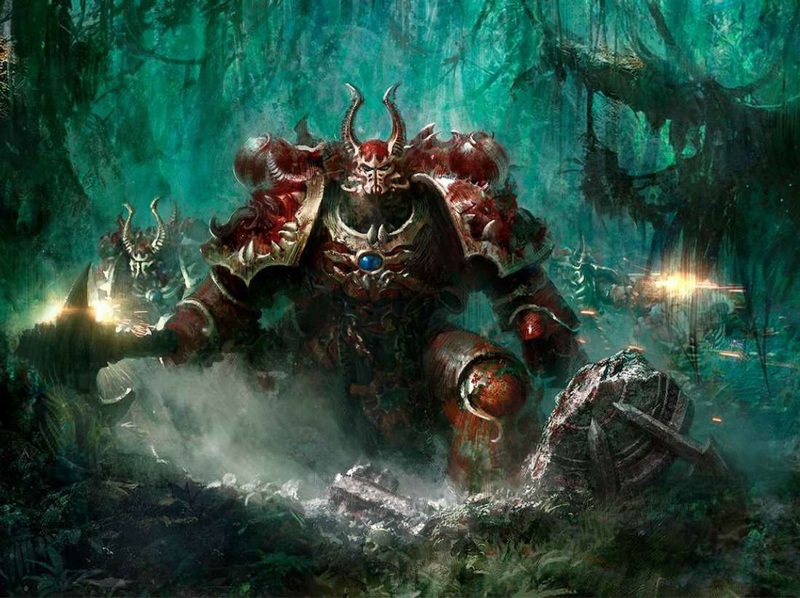 The Crimson Slaughter is the sixth supplemental codex for 40K thus far. Unlike the previous five, however, it is not based on a well-established sub-faction. Although each of the previous ones expanded on a unit or sub-faction that was already well established, the Crimson Slaughter were essentially created from scratch, getting their beginnings as a brand-new Chaos Renegade warband for the Dark Vengeance starter set. This winds up being both good and bad; good because it adds further depth to the universe and there's no worries about having to get upset over changes from past material (as you may recall, I was less than happy with how the Iron Hands were changed in the Clan Raukaan supplement). Bad because there's still certain expectations and without having an established "reputation" it's far easier for fans to react negatively to perceived absurdities (ignoring the obvious absurdities that make up the core of 40K in general, of course). Case in point: the Blood Ravens. They were created from scratch for the original Dawn of War ten years ago, and even got an Index Astartes article in White Dwarf as a promotional tie-in (back when White Dwarf wasn't just a glorified catalog). Their original presentation as being unknown gene-seed and having extra Librarians was all it took to draw criticisms of being "cliche" or "over the top", as well as their being created for a video game somehow made them less legitimate than "true" Chapters created for regular 40K. Fast forward ten years, and they're now just another Chapter; their respective quirks of having lots of Librarians and probably being Thousand Sons gene-seed generally isn't given a second glance. But, if there's one company that never learns from its history, it's GW. And history repeats itself here. Overall, the fluff for the Crimson Slaughter is solid. However, one thing that stuck out to me is a certain tendency by this book to paint them as the greatest thing to happen to Chaos since Horus himself. 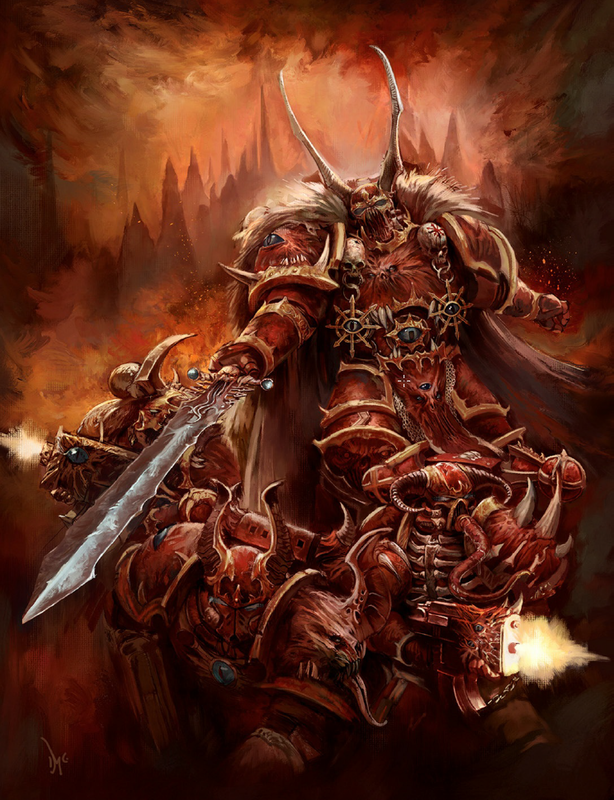 The very first sentence of the fluff says "Of all the renegade Space Marines that have abandoned the Emperor's cause, none are more feared than the Crimson Slaughter." So, right out the gate, GW basically says "Hey, these brand-new guys are totally awesome and way better than anything that's ever come before them." Not a very auspicious start. Then, a few more paragraphs down, we see "The doctrine of well-coordinated shock attacks has ever been the trademark of the Space Marines, but none employ it with the mastery of the Crimson Slaughter." So... not only are they the best Chaos Marines ever, but before they turned traitor they were the best Space Marines, too. Better than the Raven Guard, White Scars, Blood Angels, and any other Chapters that happen to be especially skilled at rapid strike tactics. They're apparently even better at being Space Marines than the Ultramarines (something I'd never thought I'd see GW actually admit, honestly). Not exactly a solid start. Thankfully, such habits don't persist very long, and the story focuses more on their ostracization from Imperial society. The actual gene-seed and progenitor of the Crimson Sabers are left unknown, which is itself a bit cliche, but the reasons for it are less-so. It seems after a spate of disagreements with various other Loyalist Chapters, including the Dark Angels, the Crimson Sabers elected to essentially erase all their history before then, and sever all ties to their progenitor Chapter. And then what few records they had sealed away got blown up, of course, and any members of the Chapter old enough to remember soon died horribly valiantly in battle, and thus the knowledge was lost. I want to take a moment to look at this. There's actually a decent amount of info sprinkled throughout about what gene-seed the Crimson Sabers might be, and it's the sort of thing that's fun to guess. Right off the bat, we can eliminate the Salamanders, Blood Angels, and Dark Angels. They don't have the Salamander look, the Red Thirst, or any knowledge of the Fallen (all the Unforgiven Chapters participate in the hunt, so, if they were DA gene-seed, the Chapter Master would have known), nor do they act especially familiar to any of them when encountering them. Obviously they're not Space Wolves, either. I think the most likely candidates are Ultramarines, Imperial Fists, or even Iron Hands. Why? Their strict adherence to the Codex is a trademark of Ultramarines and Imperial Fists Successors, and the comment by an Ultramarines Captain about their "overeagerness for acceptance" seems a likely clue as well. Also, the Imperial Fists are lame and I love seeing them get screwed over by losing or having so many of their successors turn Traitor. But why Iron Hands? The Sabers' relentless dedication to self-improvement seems to be a very fitting trait. And although the Iron Hands aren't very Codex-adherent, some of their Successors are known to be. But which is it exactly? I doubt we'll get a firm answer. In any case, a series of increasingly plot-convenient misunderstandings leads the Crimson Sabers to "accidentally" massacre an entire planet full of innocent civilians. Or supposedly innocent civilians. The book can't seem to make its mind about that. Either way, soon after the Crimson Sabers begin to be haunted by voices, thinking they're the ghosts of the civilians they slaughtered. They find killing more people temporarily causes the voices to subside (clearly they've never heard of Space Rum), and so begin slaughtering more tainted/not tainted Imperial citizens until they get declared Excommunicate, at which point they decide to martyr themselves by blowing up as much of the Eye of Terror as they can. And, of course, they wind up doing a really good job of it. Their Loyalist discipline (and the voices making them increasingly crazy) allows them to win out even against a Warband nearly equal in numbers, and a whole bunch of planets get scoured of Chaos presence. But, of course, the Eye of Terror is a Bad Place to be, and lots of little things began happening to continue to flip them over. For starters, people started mutating, and they were largely OK with it. Any attempts at keeping track of time or recording anything wind up getting foiled by the Deus Ex Chaotica energies of the Warp. Their armor starts changing on their own, because apparently Chaos does that (which I guess actually makes sense, and works perfectly for my Shadow Acolytes, who are only semi-spiky at best, having only been Renegade for a few years and having always been on the Eastern Fringe, nowhere near the Eye). To their credit, the transition into full-on Chaos Marines isn't abrupt and just a flipping of a switch as it often is in other books. A number of steps wind up getting taken, and the Chapter isn't even unified in it. In fact, lots of fighting breaks out and an entire Company that tries to stay Loyalist escapes, returns to their original homeworld, and tries to rebuild the Chapter. At some point, after starting to get worn down and things going badly, they decide to say screw it and go full Traitor. By the time it happens, I was actually slightly surprised it hadn't happened sooner, so I guess narratively it works. Although, at another later point it's revealed the Chief Librarian had been possessed by a Lord of Change for some time, and was probably manipulating them down their path for at least some of it. Honestly, I felt like that part was completely unnecessary. Especially when it's revealed the voices are probably a curse placed on them by Khorne, so a Lord of Change helping out seems unlikely. Anyway, there's a considerable amount of further material, explaining how the Crimson Slaughter has all the usual Chaos toys in the codex, why they have so many Possessed, their amnity against the Dark Angels, and their further history, even what they're doing during the 13th Black Crusade. 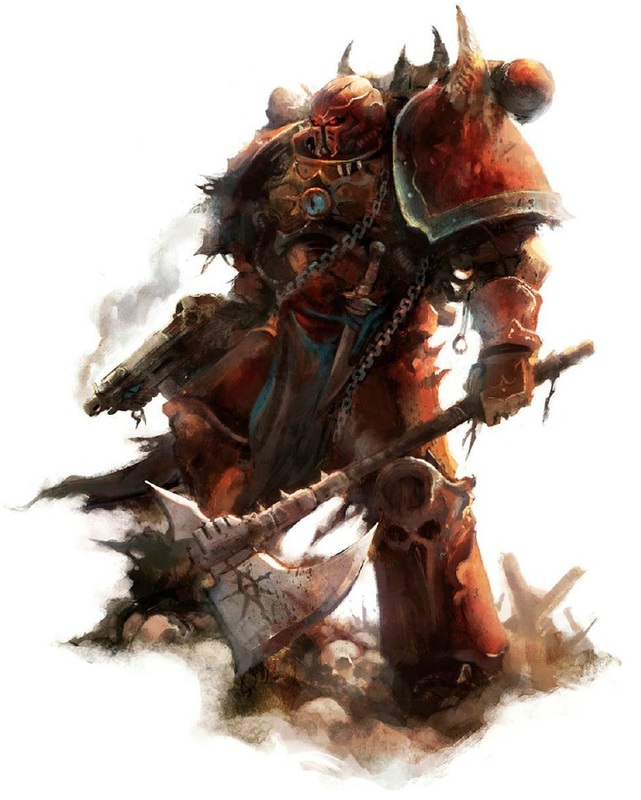 Given the Black Crusade is supposed to start in the final weeks of 999.M41 (which, if you think about it, is actually the second-to-last year of the millenium), technically the campaigns the Crimson Slaughter undertake lead into the following year, that time period GW has sworn they'd never reveal. Heh. So, overall, while there's some problem areas in the fluff (i.e. the "they're soooo awesome" bit, among others), it's pretty solid. An entertaining story worth reading. I wish more Chaos fluff was to this level. There's a lot of brand-new artwork for this book, most of which is pretty good. My only real complaint is that they seem to just show the same handful of guys each time (i.e. Kranon and the Chosen from the Dark Vengeance box. Heh, Kranon and the Chosen. Dibs on the band name!). Anyway, they did up a whole bunch of new models, too, in addition to the sample bunch from DV. And, I gotta say, these models look glorious. I mean, just look at that red. THAT is a glorious shade of red. So rich and vibrant. The gold is a great contrast, though I'm slightly more meh about the particular shade they chose. It feels too... dark? Dirty? Flat, maybe, because it's not shiny at all. I'm not sure. It feels off. 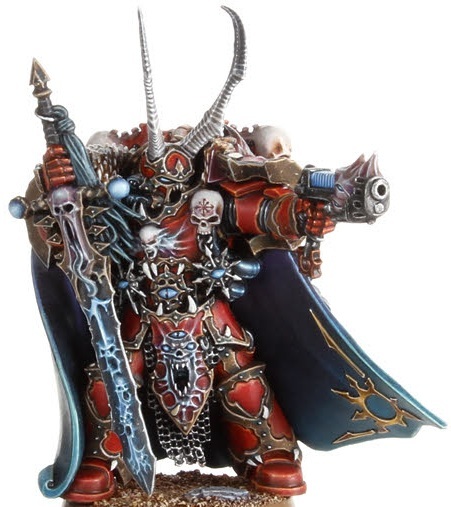 But otherwise these guys look fantastic, especially with some glowing blue plasma/eyes on them, and I wouldn't mind trying to do a few models like this, if I didn't already have plenty of Chaos to do. I am SO buying one of these for my Fractured, though. I don't care if it's a meh unit, it's just too cool! Now for the main reason anyone buys these books: The four pages of rules. The main two rules are that your entire army causes Fear (which at least seems nice on paper, until you realize most armies ignore it anyway, but the idea of Cultists causing, say, Dark Eldar Wyches to run away just by running at them amuses me greatly), and that Possessed can now be taken as Troops, with an alternate mutations table. The new benefits are actually noticeably better than the vanilla table, and are applied at the start of your turn, rather than during the Assault Phase, giving a little more utility. However, the Possessed are still very much an assault unit, which requires an aggressive playstyle. If your preference is to more sit back and plink away at the enemy, then these guys probably aren't for you. Also you're lame and stupid and I hate you forever stupid Tau. The Warlord traits are all pretty solid if your Warlord is going to be getting into close-combat a bunch, which, let's face it, you're almost definitely going to be doing. relics. There's a super-Crozius, but unless you're running a Dark Apostle, you can't take it. The Blade of the Relentless is an option for a Lord, and a pretty solid choice. It starts as a basic power sword, but grows stronger until, after 10 kills, it becomes S6 AP2 with Instant Death. So basically send your Lord through a unit of 'Gaunts, Guardsman infantry, or whatever other mooks your opponent has, power up, and rip through most everything else. The Slaughter's Horns are a guaranteed way to add Rage, Furious Charge, and Hammer of Wrath. Combined with Murderous Hate off the Warlord table, and you've also got Hatred for a VERY powerful first-round charge. Finally, the Daemonheart gives him 2+ armor and It Will Not Die for a good bit of extra survivability (especially if combined with a Toughness-boosting mount of some kind). The Balestar of Mannon is probably the relic that will see the most use. I would expect to see a lot of allied detachments led by a Sorcerer with a Baelstar, as it gives him access to the much-desired Divination discipline. There's quite a few different elements of a Chaos Marine army that would benefit from the boosts Divination can give. The last relic is called Prophet of the Voices, which basically turns the bearer into a Possessed Lord/Sorcerer/etc. I'm not sure how useful it'd truly be, but I can see some fantastic conversion opportunities for someone willing to go that route. Skipping the strategems again because, again, I've yet to actually meet someone who plays with Planetstrike or CoD. If this mythical person does actually exist, please let me know, and maybe I'll actually look at them in the next review. The Altar of War missions are their usual solid quality, providing a mix-up from the standard missions that give a challenge without being too crazy. The first one is nearly a standard mission, fighting for six objectives, but with a "spectral storm" that wanders around the table all game damaging the enemy. The second one involves needing to wipe out an enemy player and deploying in a ring around them, calling for huge alpha strike potential. The final one is especially interesting, as it's set to run for TEN turns, as opposed to the standard 5-7, the Crimson Slaughter player can bring back any non-vehicle units that are destroyed, and the defending player gets all the free fortifications they can fit in their deployment zone. I kinda want to use my Fractured as Crimson Slaughter just to try these missions out. As with every other supplement I've read thus far, they seem pretty interesting. Lastly, the Echoes of War missions are, as with past supplements, interesting on the surface for trying something unique, but ultimately too specific in what's going on to likely enjoy them more than a couple times. So, give 'em a whirl, but I wouldn't expect too much replayability out of them. Well, this review ran a bit longer than I was intending to. But I guess it shows how excited it has me. Or at least interested in it, I don't know if excited is necessarily the best word. Barring some blatant mistakes, the fluff is pretty solid overall, and the rules are generally on par, if not superior, to the basic Chaos Marine codex. They've actually created a pretty solid book here. The idea of having Possessed as Troops adds a nice option to Chaos Marines. 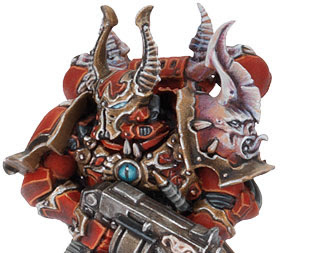 Although I've seen some argue that Plague Marines are still better in most respects, Possessed in this book aren't all that awful, and, honestly, they have a vastly better model. And it's something different. We've been dealing with Plague Marine spam for a good 5-6 years now, and I'm tired of seeing it. One nice touch that I'm glad they added is a glossary in the back for all the various rules, terms, etc. That'd definitely come in handy, at least if you have a print version, maybe slightly less so with an ebook (they always seem to be sluggish for me, even on my laptop). So yeah, I recommend this book if you're a Chaos Marine player, or just want to read some halfway decent fluff in a codex. Hopefully this trend continues with the supplements. Occasionally known as Brian, I have been involved in the 40K hobby since 2002. I have been playing the Lords of Oblivion that entire time, though I began expanding to additional armies in 2007. I am heavily involved in all aspects of the hobby, though the lore/fluff is my biggest draw. I was on the Bolter and Chainsword's Librarium staff for several years. All material on this blog is copyright Brian Hudson. Picture Window theme. Powered by Blogger.